What is "SOCIALIZATION"? It may not be what you think! My veterinarian said to call. If the first thing you imagined when your veterinarian said, "your dog needs more socialization" was taking your puppy out to play with every dog you can find, that is not what "socialization" is. In fact, by taking your fearful puppy and repeatedly overwhelming him with being petted by strangers or meeting strange dogs, you are more likely to make matters worse, not better. Slow is fast when it comes to socialization. Let your dog set the pace. Don't rush. Don't push. What frightens you? Spiders? Snakes? Heights? Imagine being dragged closer to the edge of the Grand Canyon! Or tossed out of a boat into the ocean when you are afraid of the water. Fear and caution are evoluntarily sound choices. Caution keeps us safe. Leaping away from the sound of car tires speeding by is a smart choice. In time, the puppy learns that cars don't come onto sidewalks and that he is safe when they pass and stops spooking. Well-socialized individuals have gained life experience to help them feel confident in new situations and take things in stride. If those rich and varied life experiences are positive and safe, his confidence builds. He's "been there, done that!" If he gets startled, he recovers quickly. On the other hand, if the experiences your puppy has are overwhelming or traumatic, he may become more guarded or reactive. He fears the worst in every new situation. Dogs who have had inadequate early socialization are operating at a social deficit. The decisions they make are not made based on good experiences, but fear of the unknown. Well-socialized dogs are safer dogs with a better quality of life! 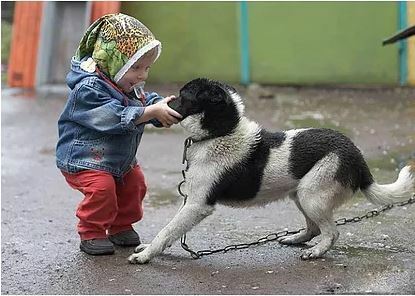 It may be an adorable child to you, but to this dog, it is a scary monster. Young puppies who just haven't been on the planet long enough to have had rich and varied confidence building experiences. Older puppies who missed the important 3-12 week early socialization window who are operating at a deficit. Winter puppies who didn't grow up with as many walks or family barbecues as summer puppies do. ​Dogs who have been in a shelter for an extended period of time. Dogs rescued from hoarding cases or puppy mills. Feral dogs. Dogs who were raised in a kennel their whole lives. Dogs who have only lived with women or only lived with men. Dogs who have only met adults and not children, toddlers but never teenagers, dogs who have never spent time around the elderly or people of different ethnicities. 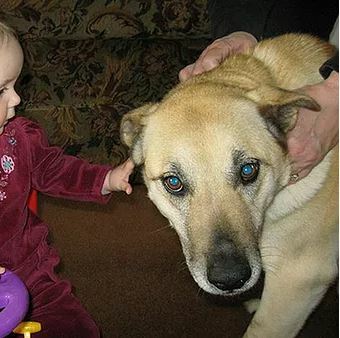 Dogs who have only met the pets in their own families, but never met unfamiliar animals outside their own circle of friends. ​Sometimes he's fine; and sometimes he's just not fine. The behavior your veterinarian saw in his office is very likely not the same behavior you see at home in the safety of your house or around people or pets your dog is comfortable with. He needs more confidence building outside the home. The dog you see in the kennel run at the shelter may not behave the same way as he will when you get him home and he acclimates to his new surroundings. Support your dog when he is worried. You are his advocate. Whether or not you think it's reasonable or warranted, to your dog, his fears are very real to him. Socialization isn't just "other dogs" ... and it isn't "playing"
It's learning how to act in social situations, how to deal with life's interactions and experiences. It's learning to feel comfortable and take new things in stride. It's being in new places - sights, sounds, smells, surfaces, stairs, ramps, elevators, echoes, whooshing of tires and hissing of air brakes, the hubub of the city, the wide expanses of the countryside. A kennel-raised dog may not be able to do stairs, may be afraid of doorways, may be reluctant to walk on grass. It's new sensations - being lifted; standing on a grooming table; the vibration and feel of a blow dryer; the feeling of being restrained; the motion of car ride;, the unsteady rocking of a dock or boat. It's new social situations - strangers: dogs, people, cats, horses. Veterinarians & groomers. Being held, petted by unfamiliar people; being sniffed by another animal or invited to play. It's learning how to politely say "no thank you" and "please leave me alone." It's important to protect him from learning that aggression works by putting him in situations where he gets in over his head. When he feels safe enough to do so, he will also learn how to say, "yes, I'd like to get to know you better" or "let's play!" If he left his litter too early or his dog experience is limited, he may need to learn how to "speak dog" - but first he needs to just feel safe observing them at a distance. Choose his mentors carefully. Shyness, uncertainty, caution are typical for your average under-socialized dog. Over time and with plenty of gentle, positive confidence building, these fade when he's had a chance to acclimate and feel safe. Global fear of EVERYthing. Neophobia - fear of anything new. Generalized fear - when traumatic situations are severe or repeated. Fear that spreads to anything similar, (all dogs, all black dogs, all men, all children. 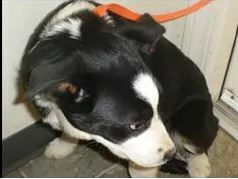 Dogs who experience a shock from an electronic collar following the warning beep, may generalize the fear of that sound to all mechanical beeping sounds, such as smoke alarms, timers, the microwave, etc. Trembling, stress panting, Becoming clingy or hiding behind the owner or under furniture. Hiding or fleeing to a safer distance to observe. Shut down - immobilizing fear. Could range from an attempt to not be noticed, or could be catatonic. Frantic search for escape - pacing, scrambling, running away. Reactivity - trying to frighten the scary thing away by lunging or barking. Aggression - if cornered with no place to escape, or pushed too far, he finds out aggression works. Combinations and/or switching back and forth between any of the above. Protect his space - give him time and room to retreat to a safer distance. 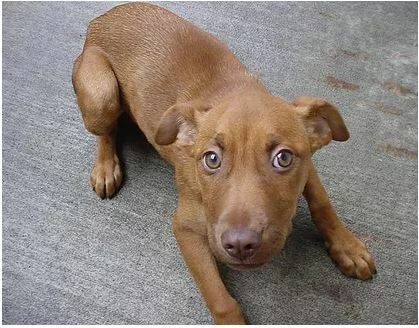 The dogs in the photos above are "over threshhold" and unable to learn until they feel safer. See this article for more information on keeping your dog UNDER threshhold where he can feel safe and make new, positive associations. Your dog will experience less stress if there is sufficient distance and/or a physical barrier defining his space. Always reward his choice to move away. ​Let's make friends. Why is it not a good idea to have strangers offer food to encourage your dog to go to them to get it? Because the only reason the dog ventures that close to the scary person is to take the food, not because he wanted to be social. Now he's too close and still not happy to engage - and he's stuck. 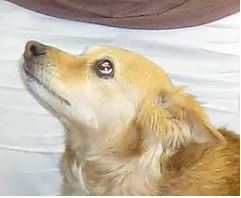 Dogs who are repeatedly baited get in the habit of rushing in too close. People think they are being friendly and reach to touch them, often resulting in a sudden explosion of barking or even biting. See this article on "Treat and Retreat" for a safe and systematic training plan to help your dog make a truly positive association to strangers and build confidence and relaxation. Never force your fearful dog to endure petting by strangers or drag him toward anything that he is afraid to approach on his own. The goal is for him to feel safe and eager to explore and for him to initiate friendship of his own accord, not because he had no choice. Trust is earned. Never punish the growls or barks of a panicked dog. These are pleas for help. He's telling you "I'm too close, I need space!" If you shut down the noise, he will soon sit there silently like a ticking time bomb with no counter, or a smoke alarm with no batteries. The barking is a symptom of his discomfort. It will stop when he has the space he needs to feel safe. When dogs experience repeated exposure to situations or stimuli, they learn to use to the behavior most likely to work. If opting out and asking their person for help is the most likely way to get them out of an uncomfortable situation and they can trust their person to help them, they will be more likely to exercise that option. ​If instead, they are put in that same situation and set up for corrections, they might learn to shut down and endure the proximity to what upsets them, but the anxiety and distress are always bubbling under the surface. Their anxiety may increase over time. The fear or resentment of the trigger is in conflict with fear of the correction from the person he should trust most. When it becomes too much to bear, these are the dogs that "just snap" - victims of their predicament, using aggression to make the scary stop.it. Should my shy dog attend group classes? Or would it be better to work one-on-one at first? If you have a young puppy or a cautious dog who just hasn't had many social experiences and takes awhile to warm up to strangers or has struggled in specific situations like the veterinary clinic or grooming shop, a class situation should be fine. We can schedule a pre-class evaluation to determine what is best for your dog. When you come to class, be sure to let your instructor know of your dog's shyness so they can help set your dog up for success. They will seat you at a distance from other students so your dog can feel most comfortable and they may provide portable gates to define his personal space to help him feel protected. Your dog's "private suite" within the classroom. 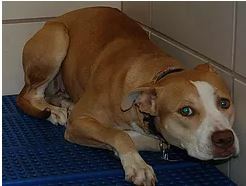 The goal of providing gates around worried dogs is to create a 'tolerable exposure', so he can be in the same room with other dogs and people without becoming overwhelmed. He will "practice" and get better at whatever behavior he displays. We want him to get better at feeling calm and safe - not be put in a situation where he is stressed or becomes more fearful or accidentally gets in over his head and has a traumatic experience. The long term goal is to reduce the barrier gradually as the dog is ready. Some dogs just need a dividing line so they feel protected, so other dogs can't get too close for comfort. Dogs who are quite worried usually feel best with a solid barrier so they can hear and smell but not see the other dogs or people as they settle in. As the stress of the environment subsides and the dog begins to relax, the blankets will be reduced a little at a time to give a view of the room. How soon the barriers are reduced will depend on your dog. Only he can tell us when he is ready to observe others in the room. Don't worry if he wants to sit on your lap or hide under your chair. Please be the source of comfort for your dog. Worried dogs may not be able to perform what they have learned as well in class as they can in the safety of their living room. Your dog's positive emotional experience comes first, his training skills come second. Note the lessons and plan to work on them at home. He will come out, he will blossom. If your dog is stressed even in his own home, we certainly don't want to subject him to the busy training environment. If your dog is a hoarding case survivor, a feral rescue, or long time shelter alumni, after discussing your unique situation, we may recommend private consultations to help you build a relationship with your dog before enrolling him in a group class. When he's ready, you may progress to private lessons in the training room, with no other dogs or families. When he's happy to work there, perhaps a small class to build his confidence around others a little at a time. Private trainers are ready to help you. Fear or anxiety is more than just an emotional problem for pets—it has the potential to cause many serious physical health problems and contribute to several others. You have no idea how easy it is to dog this and we don't even realize! In addition to puppy classes the Tellington TTouch can be extremely helpful in raising a well adjusted adult dog.